     "I can cure, save, even resurrect people provided they are in a spiritually receptive condition. It is like the positive and negative currents of electricity. My capacity to heal can be compared to the positive current. Your devotion to Me is like the negative current. Once the two come together, the devotion provides what is called the miracle of healing." 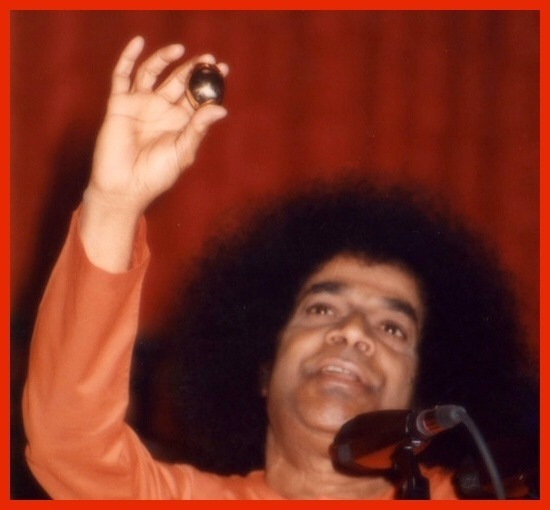 In October 1992, Bhagavan Baba visited me in a blessed dream. I was in a room performing a special ritual with great intensity. Suddenly Sai appeared and asked me what I was doing. I told Him it was a ritual to invite and compel God to manifest. “Swami,” I said, “I have a problem when I get very excited I feel sensations in my throat area. My throat tightens up and I feel very negative.” Swami replied, “Yes, yes, yes I know you are too emotional, making the thyroid out of balance.” He continued, “I will send some prayers to the thyroid and help remedy the problem.” After this amazing episode, the hypoglycemic attacks started to diminish and my ability to process simple carbohydrates improved dramatically." In January of 1994, when this author (Connie Shaw) gave a talk in Houston, Texas, USA, on the lingam photo, several people were healed on the spot simply by touching it to the afflicted area. For example, a few people who had experienced headaches that very moment were relieved of pain. One man was in pain from kidney stones; he placed the photo against his lower back in the kidney area and the sharp stabbing pains vanished." If you are in need of healing or know someone who is please take time to focus on this photo with firm faith. Inwardly visualize Lord Sai's Love expanding beyond time and space to embrace and encircle you or your friend in His Healing Aura. Feel the sweet touch of the Avatar healing the emotional, mental and physical bodies. Know that by the Grace of God you are well, whole and healthy.